The millennium brings a fresh look at one of early Canada’s great engineering projects, the building of the Rideau Canal. This new book explores a fascinating piece of Canadian history, the construction of a navigable waterway though the Canadian wilderness, between Lake Ontario and the Ottawa River, in the middle of the early 19th century. The project faced a host of difficulties including man-made problems such as survey errors, and problems with nature such as unexpected bedrock, vile smelling mud, spring floods, and malaria. To augment the text, each lockstation section includes a reproduction of a painting of the lockstation, done in the 1830s or 1840s and photos showing the locks today. A map of what each lockstation looked like when completed in 1832 is also included. 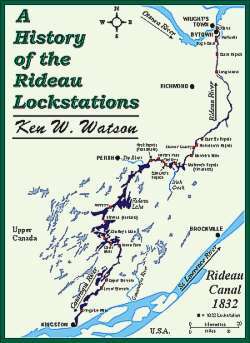 Those with an interest in Canadian history will enjoy the book, but it will be of particular interest to those who have an opportunity to visit a Rideau lockstation. The locks are living history, they are working today much as they did 168 years ago. With the aid of this book, a visitor to the Rideau Waterway can fully understand and appreciate how and why each lock was built. All proceeds from sales go to Friends of the Rideau.